Published: Sept. 14, 2012 at 01:42 p.m. Updated: Sept. 14, 2012 at 05:53 p.m.
EAST RUTHERFORD, N.J. -- Over the past eight days, the New York Giants have had nothing but time. 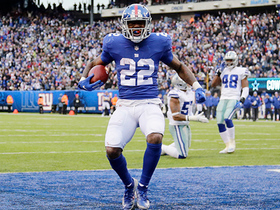 Time to reconsider, rewatch, relive their season-opening loss to the Dallas Cowboys. Time to prepare for the Tampa Bay Buccaneers, whose defense is suddenly alive and whose offense is balanced under coach Greg Schiano. Time to wait until 1 p.m. ET Sunday, when the Giants take the field again and, as Justin Tuck sees it, have a chance for redemption. The above scenarios are surely true for most Giants players and many in the Timex Performance Center, where the team trains. They are not true for Tom Coughlin. Over the past eight days, Coughlin has not had enough time, even with clocks set five minutes early. He is in a perpetual hurry, a man determined to make his players understand -- really understand -- that even their best efforts won't always be enough this season. 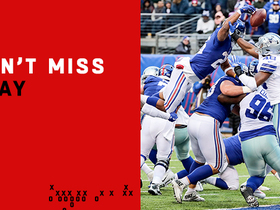 Because the 2012 Giants' opponents are formidable, comprising the toughest schedule in the NFL. And if there is 110 percent to give, Coughlin believes foes will find it. That's life as a defending Super Bowl champion. "We talked all week about playing and practicing better, having better energy," Coughlin said. "Having a sense of urgency about 'getting our football right, right now,' as I say it." And this is life when the Giants are already 0-1 and have 10 days between games to simmer. When told Tuck said that he hadn't slept well since the loss, Coughlin replied: "None of us have slept well. I hope the whole room is full of people that didn't sleep well. That's the point." "Energy. Enthusiasm. Pride. Second game of the season. Didn't like what we saw for the most part in the first game. Renewed vigor. Vigilance. Unselfishness. Do your job. Understand. Listen. Pay attention to the details. Follow the details through in the chaos of the game." His players do understand. They know quarterback Tony Romo, who found a comfort zone against the vaunted Giants pass rush, completed 76 percent of his throws. That the Cowboys rushed for 143 yards. That Kevin Ogletree looked like Jerry Rice. 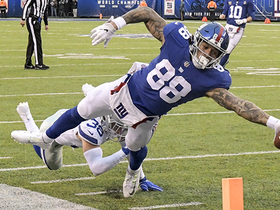 The Giants fumbled away one opportunity, by rookie running back David Wilson, and botched another, settling for a field goal despite a first-and-goal at the 1 after a turnover. They dropped passes, three alone by Victor Cruz. The Cowboys held an eight-minute edge in time of possession and looked like the hungrier, more physical team. How's that been sitting for the better part of a week-and-a-half? "After we lose," running back Ahmad Bradshaw said, "everyone has something to prove." Said left guard Kevin Boothe: "There is urgency to improve. Because what we showed the world (against the Cowboys) was not a very good football team." Perhaps right guard Chris Snee, who is Coughlin's son-in-law, most simply and effectively captured the postgame nature of his head coach: "He doesn't like when we lose, and he's in a good mood Monday when we win." 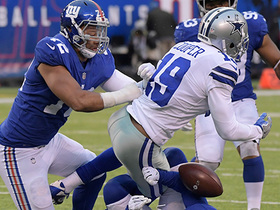 Before the Cowboys game, players talked about knowing they had a target on their backs. But their play did not suggest that they really understood. So Coughlin has reinforced that message, time and again. "He's trying to get everyone to buy into that," tight end Martellus Bennett said. "And he's on everyone, from (quarterback) Eli (Manning) to the practice-squad guys. He's on top of everything." Said defensive end Jason Pierre-Paul: "Everybody that plays us is going to come after us, so we've got to stay focused and we've got to give 'em 110 percent, too." And Cruz: "(Coughlin) demands the best out of us and wants us to practice like it. He wants us to play like it." Coughlin didn't smile, not this week, but he did say, "I think they got the message." Boothe described Coughlin's insistence on improvement as designed for the long haul, but with a sense of urgency. In other words, 0-2 isn't going to cut it. "We have 10 days of sitting there, chomping at the bit to get out there," right tackle David Diehl said. "Players feel it. Coach Coughlin feels it. You can tell by his energy. He's running around, bouncing in and out of meetings, going from drill to drill, yelling and encouraging. That's Coach Coughlin." And so is this: At his weekly press conference, Coughlin fielded 37 questions. Five received one-word answers. He had little time for the perpetually hurt. Question: "(Offensive tackle) Will Beatty is not on the injury report, so he is not injured?" Coughlin's response, in its totality: "I ask that question myself." And myriad queries about Schiano and his transition from college head coach to NFL head coach -- a path Coughlin knows firsthand, having jumped from Boston College to the Jacksonville Jaguars -- tested his patience. "When you made the transition from college to the NFL, do you remember facing questions (as to) whether that type of system will translate to the NFL?" a reporter asked. "There's a well-documented record of that," Coughlin said. "Thank you." This wasn't the week for introspection or reflection. Not for Tom Coughlin. He walked briskly from the podium. There was work to do.